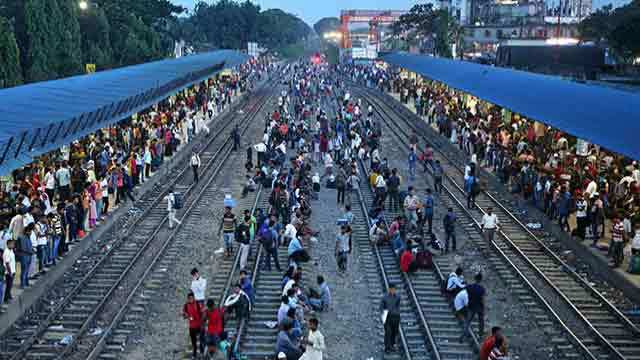 Dhaka, Aug 20 (Just News): As people are streaming out of the capital on Monday, last working day before Eid-ul-Azha holidays, they are facing immense sufferings due to belated trains and disruption in ferry services. Since morning people were rushing to capital’s railway stations, bus terminals and launch terminal to leave Dhaka. At Kamalapur rail station, most of the trains on northern routes were behind schedule. Rangpur express on Dhaka-Rangpur and Nilsagar express on Dhaka-Chilahati routes were late by four hours, Dhumketu express on Dhaka-Rajshahi route was by three hours and a half and Sundarban express on Dhaka-Khulna route was by two hours. Lalmoni Eid special service was scheduled to leave Kamalapur at 9:15am which reached to the station at 1:15pm. On the other hand, Drutojan express on Dinajpur-Dhaka and Silkcity express on Rajshahi-Dhaka routes were late by three hours. Many people were seen to travel on train roofs defying ban. New Age correspondent in Munshiganj reports that on Monday morning more than 500 vehicles, mostly cars and motorcycles, were stranded in the Shimulia ferry terminal area to cross the River Padma. A total of 17 ferries are carrying vehicles due to navigability problems. A good number of people were seen at capital’s Mohakhali, Gabtoli and Saidabad inter-district bus terminals since morning. A huge number of people started to gather at Sadarghat launch terminal on the day as many apparel workers got vacation on Monday. Crowded launches were leaving the terminal while Bangladesh Inland Water Transport Authority officials said the crowd would be bigger in the evening.